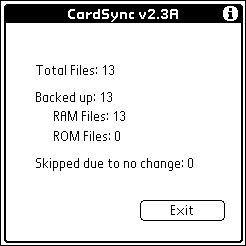 CardSync allows you to make a backup of all the installed files on your Palm device to an installed memory card. 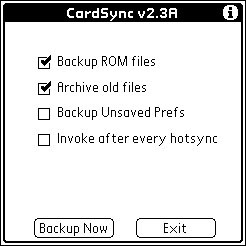 CardSync allows you to make a backup of all the installed files on your Palm Connected Organizer to an installed memory card, on a file-by-file basis. 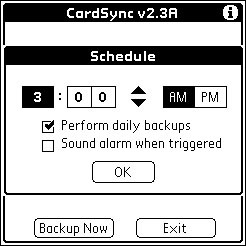 Also, CardSync permits daily automated/unattended backups of any changed files. Files on the memory card are stored in a format that is 100% compatible with the files stored on your PC's hard drive. CardSync requires a VFS enabled PalmOS device, a Handera device with a memory storage card (HandEra 330 or TrgPro), or an AxxPac equipped Palm IIIx. CardSync registration is $10 USD. It is available from PalmGear. Registered users are entitled to all future updates. The registered version of CardSync has no restrictions in it. Fix restore bug on "loaded" m505 devices.